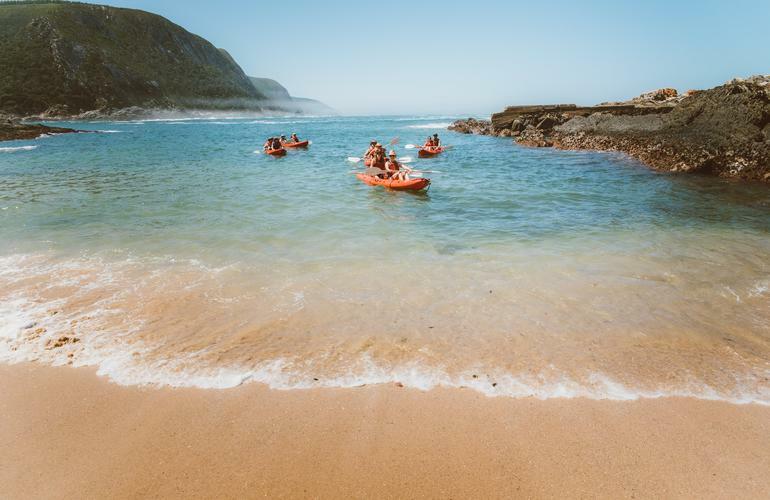 These two to three-hour kayak and lilo excursion on the Storms River is Untouched Adventure's most popular activity for many reasons! 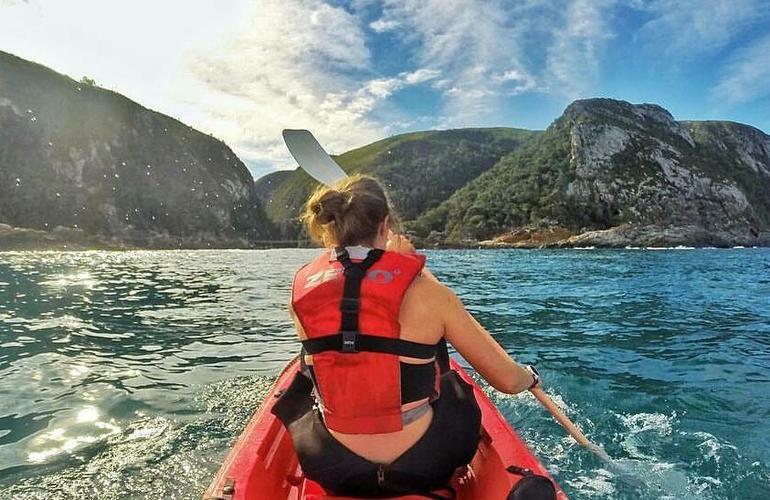 This kayaking excursion is not limited only to paddling, it consists of several phases in which you’ll get to explore deeper into the hidden world of the Storms River gorge and experience the long, bottomless pools, deep caves and ancient forests with nothing but the quiet noises of nature around you. 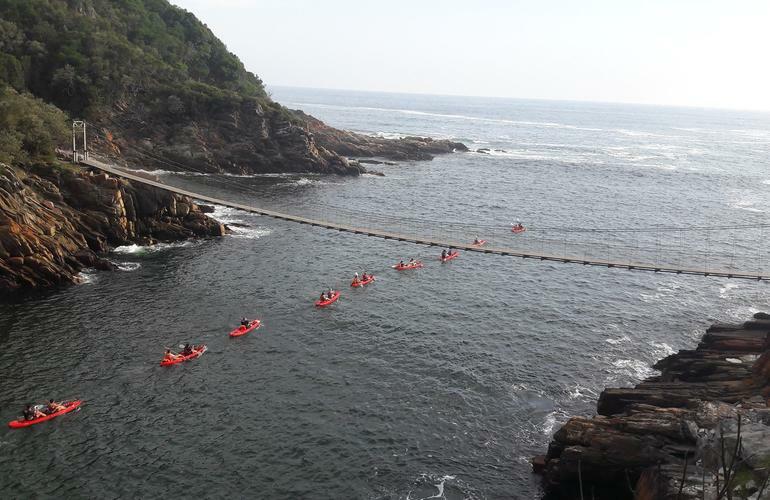 First, you will paddle from the harbor (next to the beach) across the ocean, passing underneath the suspension bridge, brace yourself because this is where the suspense begins, and from there you'll go up the beautiful Storms River gorge. 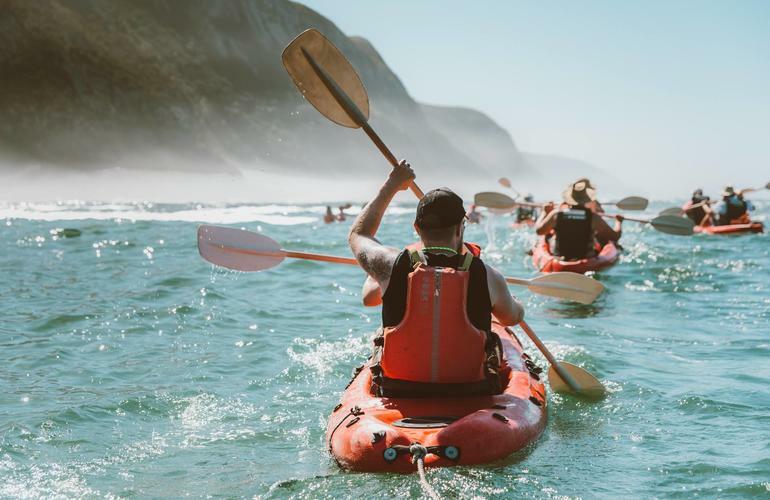 Then, after waving to all the somewhat jealous tourists photographing you from the suspension bridge, you'll continue the kayaking voyage up the river. 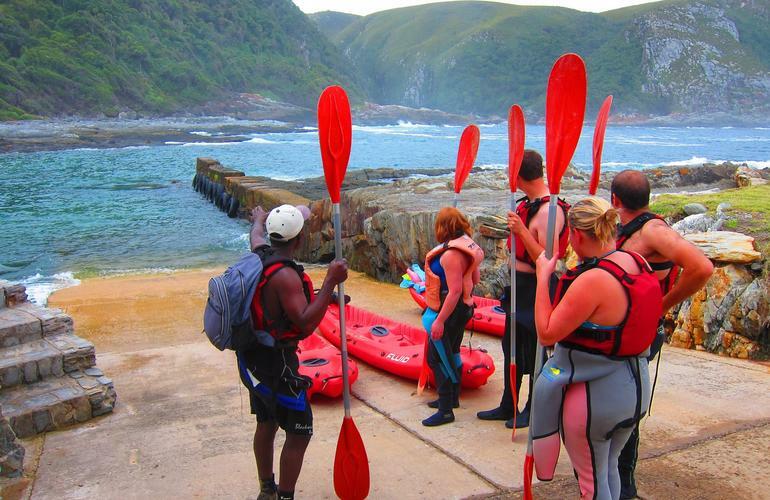 There is where the true adventure starts, paddling up the glorious Storms River, the ultimate treasure of Tsitsikamma National Park where you are about to go treasure hunting! 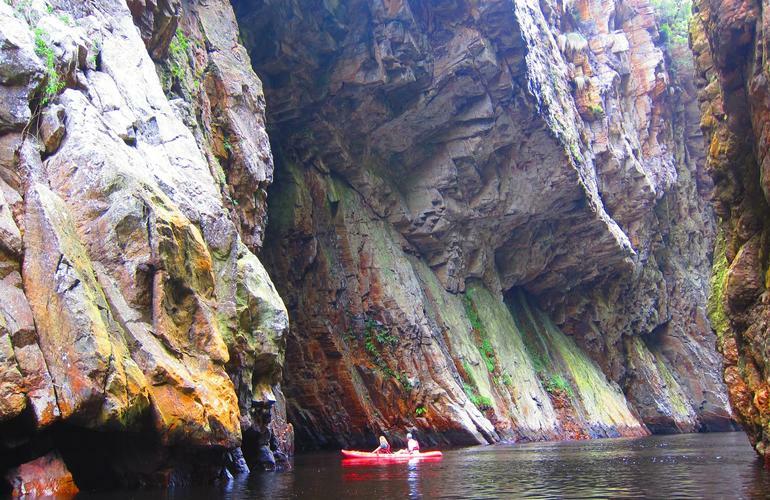 The group will continue right into a bat cave and spend time gazing up in awe at the spectacular cliffs all around you all from the comfort of a double seat kayak. 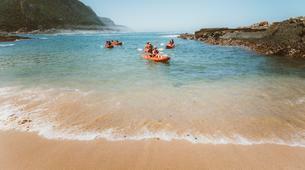 After reaching the low-water point, you will say goodbye to the kayaks and hello to a new kind of vessel, a lilo. 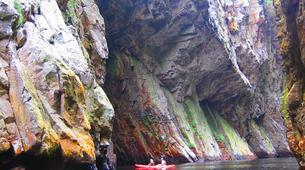 A lilo is a small inflatable boat that is designed for this trip to access the narrow parts of the gorge. 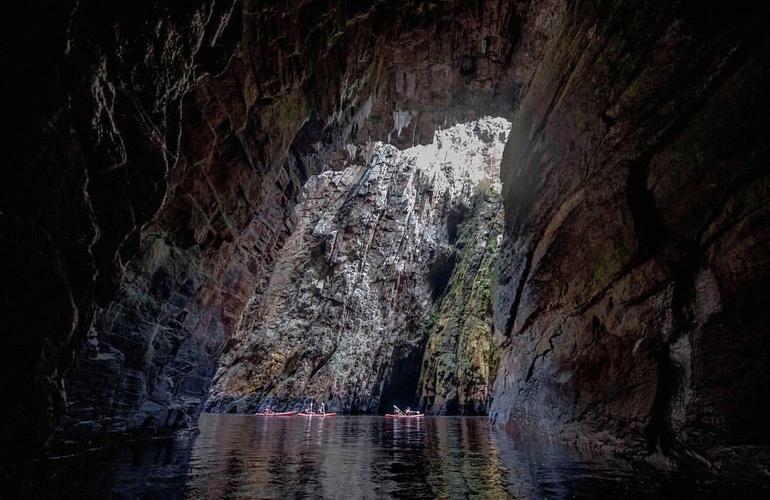 From here on you will walk over a short section of rocks and then simply float deeper up the river on the lilos feeling insignificantly small when you look up to the imposing cliffs surrounding you. 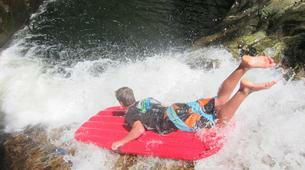 Upon reaching your destination, you'll make a U-turn and float back down river to the kayaks. 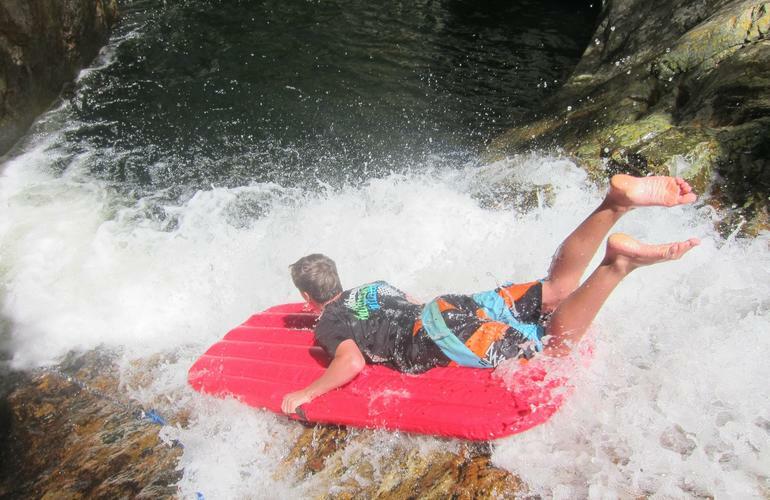 The final part of the excursion will add a healthy dose of adrenaline! 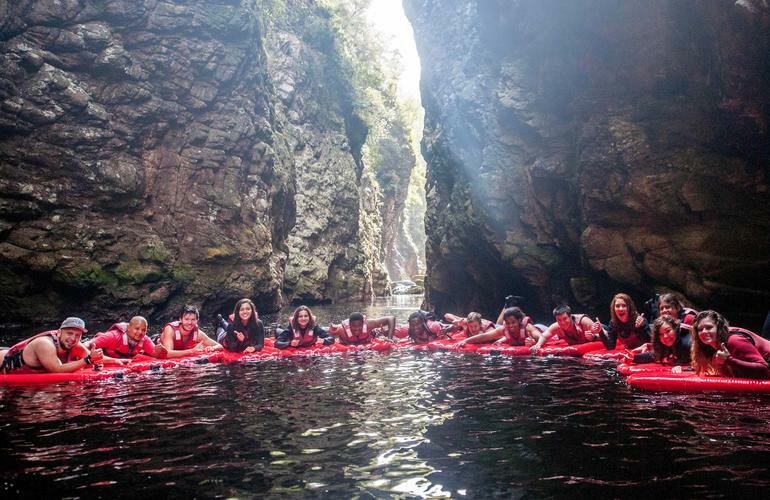 On the trip back, you will be given the exhilarating opportunity to leap off the overhanging cliff walls of the gorge into deep pools. 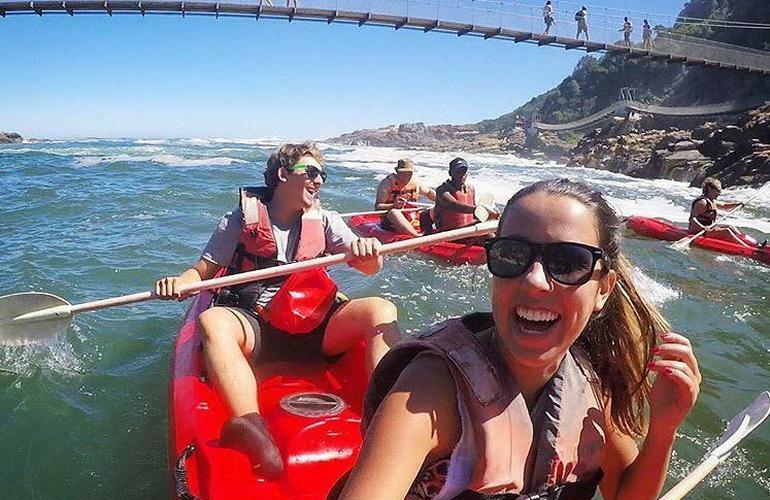 This offers not only a good test of your bravery but also some good occasion for laughter, friendly encouragement and one-of-a-kind photo opportunities. 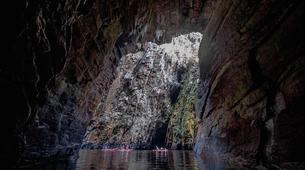 The cliff jumping is not compulsory, you can simply enjoy the spectacle as you leisurely float on the long pools below! 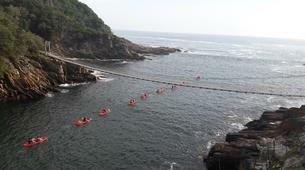 All participants must be able to swim. Minors must have authorization from their parents. 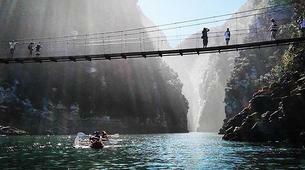 The center is located inside the National Park, and conservation fees must be paid upon arrival at the gate. 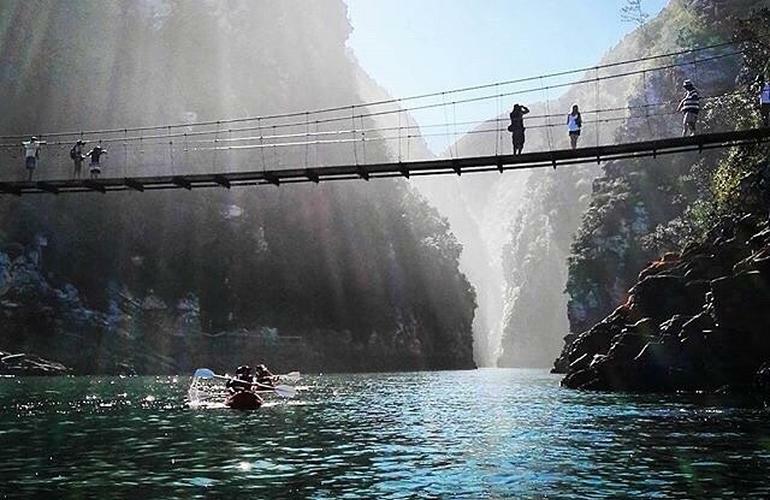 During peak summer season it can take an hour or longer to get through the National Park gate. Please allow for this in your travel planning. 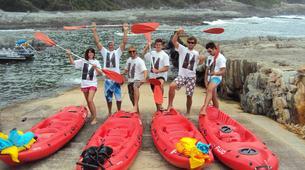 The activity can be rescheduled in case of big swell or bad weather. 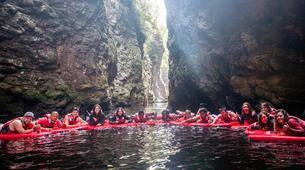 Fun, exciting & out of the ordinary way to explore the Storms River. Great! Beautiful views- A little rushed. 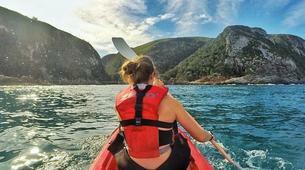 The scenery is beautiful, the kayaking great for the muscles and Pat and Bradley were wonderful! Because of the constant high turnover of people, you feel very rushed to get there see it and get back before the next group need to go and that felt very impersonal. It could have been a little more chilled it felt like we were on a school trip at times. It was a good experience in the end. Es war eine ganz tolle Tour mit einer netten Gruppe. Wir hatten viel Spaß und die Guides passten super auf alle auf. Auch beim umsteigen auf die Luftmatratzen war immer jemand zur Stelle. Wer wollte konnte zum Schluss noch den Sprung aus ca. 7 m wagen. Dies war aber kein Zwang. Ich habe in der Zeit im Wasser auf dem Lilo gechillt und fotografiert. Durch den starken Wellengang starteten wir erst im Kanal/Mündung dies war ein wenig anstrengend da wir erstmal ca. 20 min wandern mussten. Treppen hoch und runter... Sehr anstrengend wenn man nicht gerade sportlich ist. Man wird aber mit traumhaften Aussichten belohnt. Alles in allem eine tolle Erfahrung. 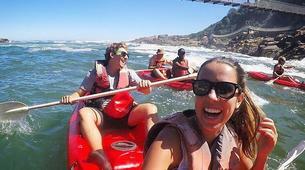 Fun variety between kayaking, lilo and swimming. 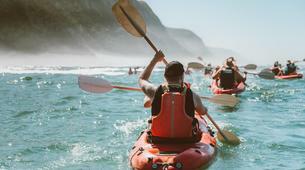 Kayaking was minimal, most of the trip is walking to where you get in the water, and waiting to get your whole group settled. Actual kayaking time is probably 30 minutes. I would actually pay MORE to have a smaller group. We had a great time, really good fun. The Canyon is beautiful and it is big fun however too expensive for only 2,5 incl Instructions etc. 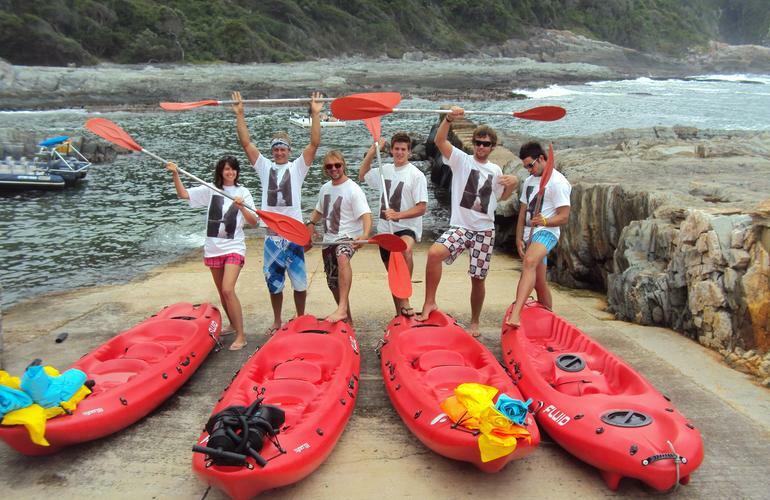 you can hire canoes for a fraction of the Price on Keurbooms Rivier which is also very beautiful. 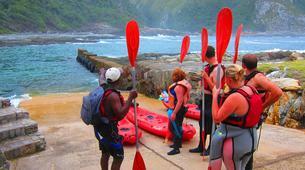 Based on customer feedback this is a TOP RATED activity you can count on.